Heather Robertson knows all about small spaces. Before she joined the Room & Board San Francisco team as a Design Associate, she worked on custom storage solutions for California Closets. 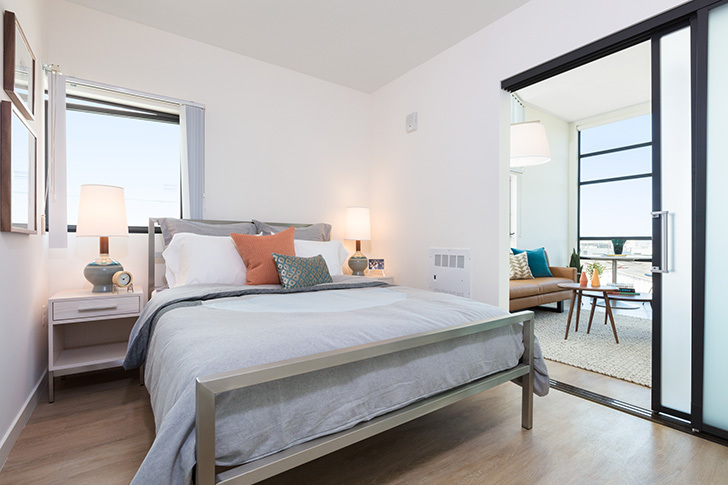 So when nearby O&M properties asked her to stage and furnish a small space condo in the Dogpatch area of San Francisco, Heather knew just how to maximize the small square footage. 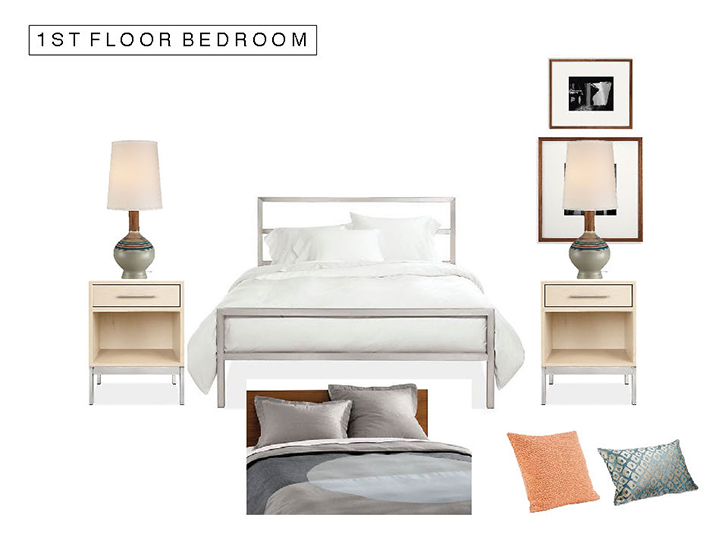 “At Room & Board, we want to tell a great story with our furniture but we also want to inspire people with a livable space. Asking questions like ‘”How would I really live here?’ or ‘How can I maximize the space?’ helped me get a start on the project,” Heather tells me. 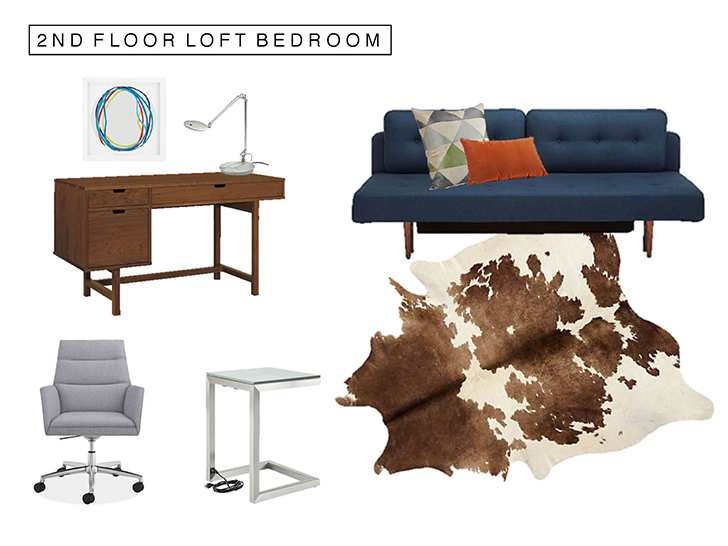 Heather floor planned the apartment with specific Room & Board products in mind. 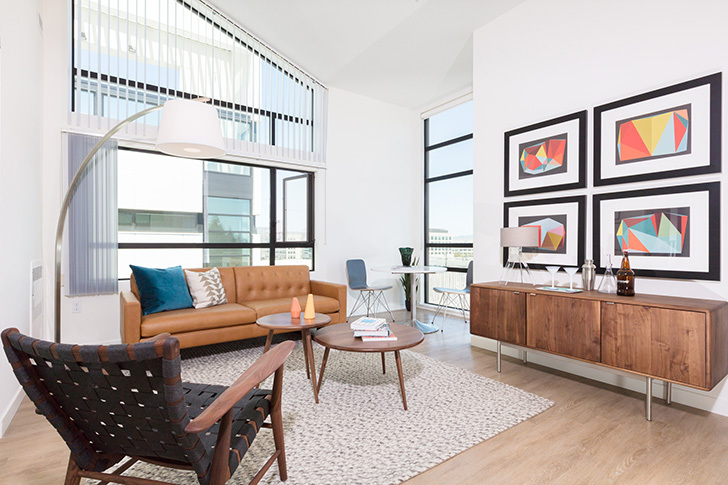 “The demographic around this area resonates with mid-century style, so we started from there and then I really looked at the space as a whole and thought about how the entire space would feel once put together,” says Heather. Heather mentions that often times, furnishing a small space is about scaling back rather than having to choose either/or. Choosing a smaller size sofa or opting for one accent chair instead of two still gives you all the style and function you need without crowding the room. She also let me in on easy small space secrets: round dining tables with a pedestal base keep a space feeling open and airy and when you’re selecting storage pieces, a long, low media piece will feel lighter than a tall bookcase. And my personal fav: infuse rugs and pillows where you can to get texture without taking up space. “We really thought ‘Okay, what pieces are going to play well with each other?’ because each room plays into the next. 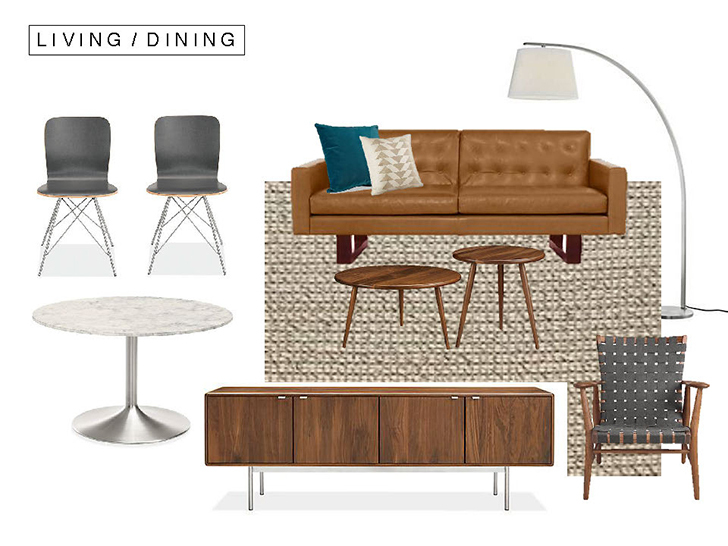 We kept a consistent mid-century theme throughout and incorporated similar materials in each room. We went lighter with stainless steel and our ash with sand stain in the bedroom because that space is extra small. Lighter materials help it feel larger,” says the design expert. 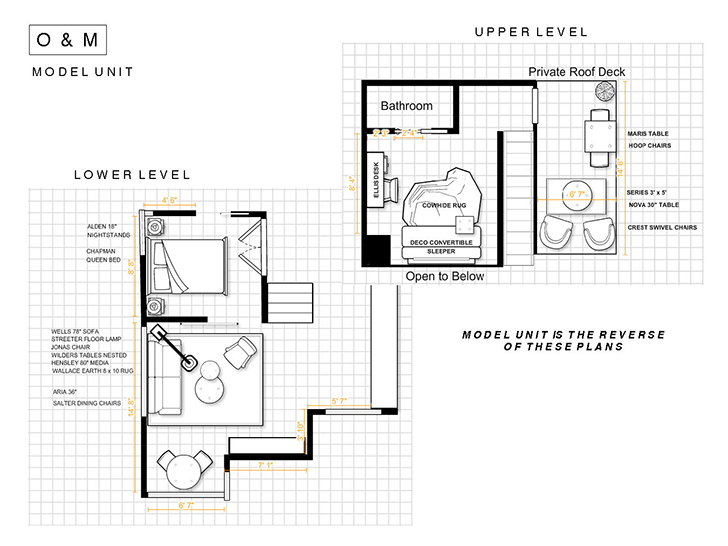 As Heather walked me through the plan for each room, the second floor loft/bedroom stood out to me in particular. It completely maximizes the small space and offers triple functionality between office, guest room and extra living room. 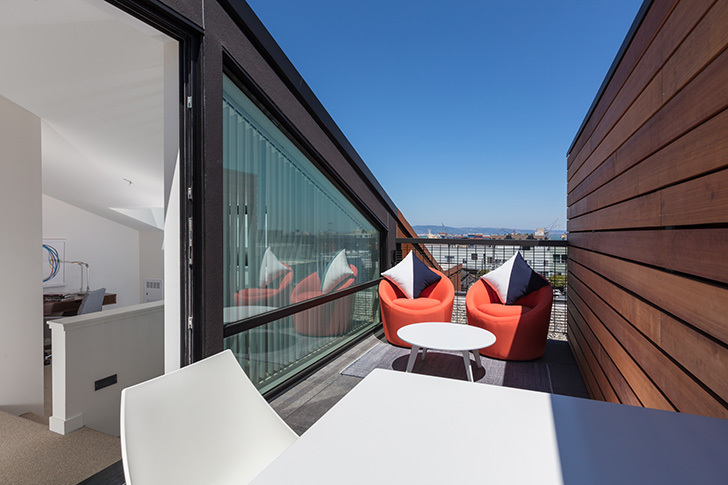 Heather was able to include a spot for outdoor dining and lounging on the small San Fran patio. Crest swivel chairs offer tons of comfort at a small scale, making them perfect for a smaller outdoor area. 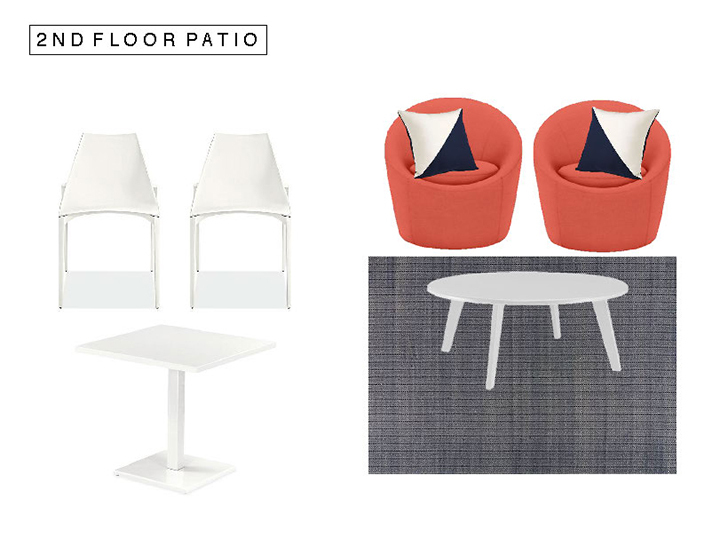 White furniture keeps the space bright and clean, while our outdoor Series rug ties it all together. Check out how everything came together! Wells 78″ sofa in Lecco camel leather, Ira lounge chair, Hensley media cabinet, Wilder coffee and end tables, Streeter floor lamp, Henri Boissiere artwork, Kip table lamp, Aria dining table, Salter chairs. 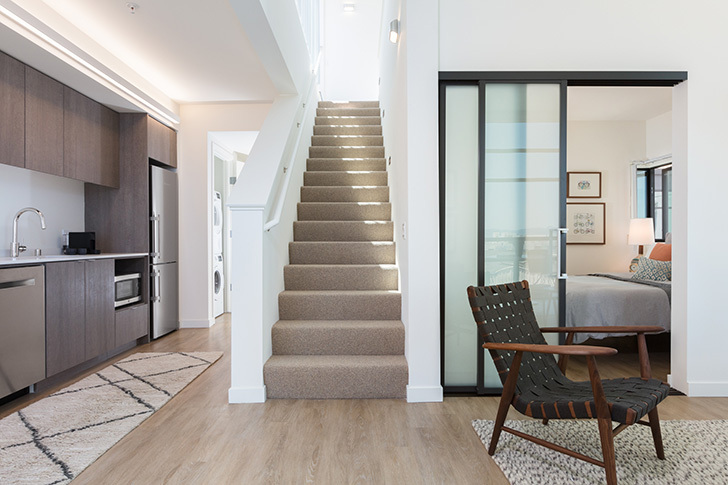 “Even though this is a staged condo, we work with small spaces all the time,” says Heather. “This area of San Francisco is so cool because it’s a mix of of the new with the old. 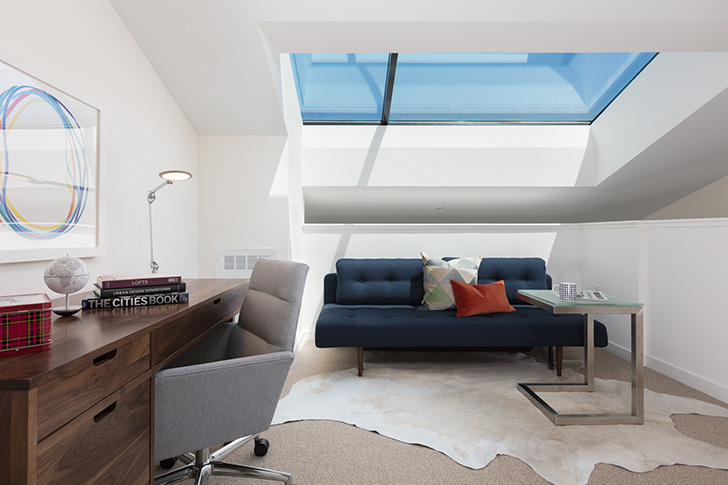 So many industrial buildings are being renovated to look sleek and modern or warm and eclectic, and all the Design Associates at Room & Board San Francisco are able to help floor plan these homes.” Whether you’re in a San Fran condo, a walk-up in New York or a Midwest ranch, you can get started with our free design services today!